After a very productive time at the British Chess Championships, Sam Herring has excelled at this year's Terafinal in Loughborough, finishing a very impressive joint second! There were over 50 participants in the Terafinal itself, but this is out of over 70,000 entrants at the beginning of the competition many months back before the Megafinals, and then the Gigafinals, reduced the numbers for the final weekend. Many congratulations to Sam on this achievement (and the handy prize money that came with it!) The final position table of the Terafinal can be found here, and the cross tables here. For some photos as well you can follow the following link here. Meanwhile, running alongside the Terafinal, were the Challengers sections. A number of Northants or Northants related players were involved in these, including James Kearney (who finished joint 5th) Dominic Holmes (joint 7th) Milly Kotecha, Kishan Modi, and Ryhs Davies. All the results for the Challengers can be found here. Well done to all those involved. The two weeks of the British Chess Championships, this year held at the University Of Warwick, have recently come to an end. Three Northants juniors were playing across a number of sections. The most successful of these was Sam Herring from Oundle School, who finished in joint second place in the Under 16 category with a score of 4.5 out of 7 - just half a point behind the winner. Also in this section was Owen Robinson, who scored 1.5, and meanwhile, in the under 12 section, Max Miller scored 2.5 points. Sam Herring also played in the Major Open - a high level event over 11 rounds, and he finished in joint 16th with a score of 5.5, coincidentally the exact same score as Chris Gibson who some of you may know from junior county training sessions amongst other Northants Chess. Sam Herring's father though went one better than Sam, finishing as the winner of the under 140 grade section, whilst James Jackson, who some of you may also know from training, was playing in the main Championships themselves, and finished with a very impressive 7 out of 11 resulting in joint 10th place out of 77 competitors. Well done to all these players. For all the scores and full details of the event, you can find the website here. The Glorney Gilbert International is a match played for by a number of different aged junior national teams from the British Isles. In the past a number of Northants players have successfully been chosen to play in one of the teams, and this year Max Miller made the trip to Ireland to play against the host nation as well as Scotland and Wales, in the Bernadette Stokes Cup for under 12 players. In what was a very close affair, the England team won by just half a point from the Welsh, and the results for that section can be found here, whilst the website for all the sections can be found here. Many congratulations to Max and to the rest of the England team. These begin in just over a weeks time, so if you want to enter but haven't yet done so then visit the dedicated website for full details here. This competition acts as an England qualifying tournament, details of which can be found here. Meanwhile, other players to keep an eye open for are James Jackson (The Championship) and Chris Gibson (Major Open) who have both been involved with our squad training either now or in the past. Also, in the under 140 grade section is Tim Herring - Sam's Dad! Good luck to all these players, and to anybody else from Northants who may make the journey over the border to play at the University of Warwick - we will keep you up to date as to how everybody fares. This year's Northern Gigafinal, the next stage in the UK Chess Challenge, took place in Manchester over the weekend of July 11th/12th, and there was a good turn out from Northants and our neighbours. Top performing was Sam Herring, who yet again came up against Owen Robinson in the final round of a tournament. The two Northants players drew their game, resulting in Sam qualifying for the Terafinal in August, whilst Owen qualifies for the Challengers section. The other Northants player to qualify for the Challengers section was Dominic Holmes, whilst players with strong Northants connections who also made it were Milly Kotecha, James Kearney, Matthew Lo, Rhys Davies, and Kishan Modi. Many congratulations to all these players, and also to all those who made the journey north, many of whom only just missed out on qualification themselves. William Holmes, Manasi Mehta, Ethan Rowe, Alastair Mottram-Epson, Emily Rowe, and Briony Tomkins. All the results from both days can be found on the UK Chess Challenge website, with Saturday's results here, and Sunday's results here. Despite a late start due to traffic problems for some players another very successful Rockingham Megafinal took place at Malcolm Arnold Academy on Saturday 16th May. This is part of the UK Chess Challenge, and all the supremos and supremas, as well as those scoring 4 or more, now qualify for the next stage of the competition, which is the Northern Gigafinal which takes place over the second weekend of July in Manchester. Invitations to those that have qualified will be sent out in early June. Well done not only to all those that qualified, but also to every player that took part in a great day's play. Photographs of many of the winners can now be seen here, whilst all the final scores are now available to view here. website here, with the scores and details of those that have qualified for the Gigafinal available here. Megafinal Trophies waiting to be awarded. After a good qualifying performance at the zonal the under 11 team travelled up to Nottingham to take their place in the National Final. However, with the loss of a few players from the top boards the team found it tough going and despite everybody giving their best, and a few good individual performances, the team finished in 15th place - from their three games all obtaining 2 points were Manasi Mehta, Sam Kennedy, Aashish Reddy and Vignesh Sudhakar. Meanwhile, at the top of the pile were Barnet and Kent again, but this time even number of games won could not be used to separate them and so the prize of top under 11 team this year is shared. Congratulations to both teams, and to all the Northants players. All the detailed final scores of both teams and individuals can be found here. These championships are one of the qualifying tournaments for players to make the England Squad, and once again these took place here in Northamptonshire, at the Daventry Court Hotel. A number of Northants players took part, with Sam Herring, James Kearney and Owen Robinson playing in the under 16 section, Alastair and Peter Mottram-Epson playing in the under 14 section, Max Miller in the under 12 section, and Krishnan Srinivasan in the under 10 section. Sam was the best performing of these, finishing in joint 5th place with 3 out of 5, just half a point behind the winners! Well done to Sam, and to all the Northants players who participated. The scores of all these players, along with all the entrants, can be found here. This performance by Sam was followed up by a superb result in the 40th Nottingham Chess Congress, where he was up against some very tough opposition in the Open section. Sam finished joint 8th, with a share of the under 170 prize money. All the scores from Nottingham can be found here. Just seven days after the girls final, it was the turn of the Northants under 9 players to take on the best teams in the country. This time however there was a slightly shorter journey for us, as we were hosting the event ourselves at Malcolm Arnold Academy in Northampton. The team gave a very good account of themselves, finishing in 11th place out of 18 teams. All the detailed scores will shortly be available here. Notable performances came from both Anirudh Kandikattu and Saarah Javaid, who were both unbeaten on the day, Saarah even managing to take one of the few points off of Barnet, the eventual winners! Congratulations to Barnet who have now won both the girls and under 9 finals. So, whose going to stop them taking a clean sweep of all the championships? We'll let you know, when we travel up to Nottingham for the under 11 final on 9th May! For the first time in a number of years Northants were very pleased to manage to get a girls team together this season. That would have been success on its own, but the team did Northants really proud at the recent EPSCA Girls Final which took place in Gloucestershire, by finishing a very creditable 8th out of 15 teams, and only half a point behind 7th! Every girl played their part in a wonderful result, although Abigail Coombs, Milly Kotecha, and Ariona Basu all managed to achieve two wins each. The final scores can be seen on the right, whilst the scores of all the teams and all the players can also be viewed here. Recently the under 11 team also played in their zonal, which was hosted by ourselves at Malcolm Arnold Academy in Northampton. We are very pleased to say that they finished a very creditable 5th, and with that qualify for the EPSCA National Final, which will be held in Nottingham in May. The whole team performed brilliantly to enable them to finish comfortably ahead of the qualifying cut off mark. Congratulations have to go however to both Barnet and Kent, who both scored a very impressive 49 points out of 60, with Barnet taking the title due to winning more games. The scores of all teams and all players can be found here. Meanwhile the results of the south zone can be found here, and the north zone here. The EPSCA zonal matches are qualifiers for the national finals in both the under 9 and under 11 age groups. Northamptonshire travelled down to Richmond to take part in the under 9 zone east section recently. Though they started slowly, they improved with each round, and missed out on the qualifying 5th place by just two points, and indeed were only 3.5 points behind 4th place - if only there had been one more round! However, as we are going to be hosting the final ourselves we are eligible to enter, and so we will have to see what we can achieve on "home soil". All the children had a great day, and their scores, along with that of all teams and all players in the match can be found here. Meanwhile the results of the south zone can be found here. Next it is the turn of the under 11 team to try and qualify for their final, and we will keep you informed as to how they get. During our county championships a special award was made to Max Miller, who over the past year has represented England (and Northants!) so well. In particular Max was chosen to take part in the World Schools Chess Championships in Brazil, but this was just one of the many highlights that the last 12 months have included for Max. 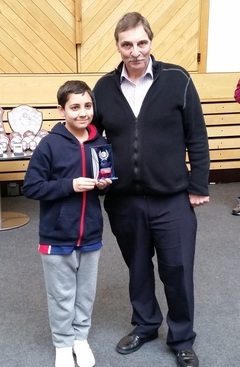 The award was presented by the NSCA's John Warren, who has followed Max's progression closely and encouraged him on his rise up the chess ladder. Max then completed the day by scoring a perfect 6 out of 6 to take the under 11 County Champion title. Details of those championships can be seen below. Many congratulations to Max on a great past year, and good luck for the future ahead. Our County Champions for 2015 have now been crowned! A very good turn out was seen at Malcolm Arnold Academy in Northampton for this years Junior County Championships, and every section was a closely fought affair. However, through it all came our new champions, and many congratulations to every one of them as well as to all the players who came along and gave their best in trying to be the best. You can see them all here, whilst all the scores from the day appear here. The season long NSCA Grand Prix is becoming extremely close in many sections, and the latest scores for that can be found here. During the first weekend of February two junior championships were taking place at the same time. Down at Yateley Manor in Surrey the long established South of England Championships were being played - these are a two day, long play event, which has for some time been one of the competitions from which players can attempt to qualify to play for England. But this year also saw the first staging of the Northern Junior Championships, a one day event taking place up in Leeds. We are pleased to say that players from Northamptonshire made the journeys in both directions to take part in both events. Down at Yateley Owen Robinson and Max Miller were playing in the under 16 and under 11 sections respectively, with Owen scoring 2.5 out of 5 and Max 2 out of 5. Well done to both. Meanwhile, in Leeds, six Northants players were taking part. In the under 16 section Eva Ressel scored 4 out of 5, and with it joint runners-up spot. However, in the under 14 section Ben Raine went one better, jointly winning the section, also with a score of 4 out of 5. Also in that section Bryony Marsh was joint runner-up and won best girl, scoring 2 out of 5. In the under 12 section Ethan Rowe also scored well, finishing with 3 out of 5. In the younger under 8 section both Luca and Zak Gillespie were playing, scoring 4 and 3 out of 5 respectively. Luca's score also gained him joint runner-up spot in that section. 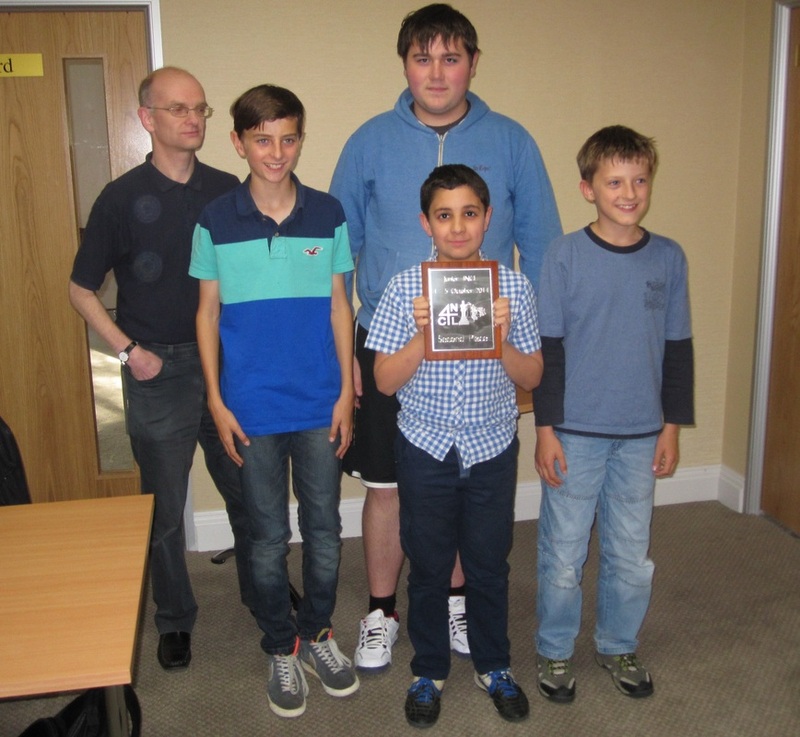 Congratulations to all six players at the Northern Championships, who also represent Northampton Junior Chess Club, and you can find out further details of the players scores via their website here. You can also find all the winners of each section on the relevant ECF web page here. Nottingham held their annual Rapidplay Championships recently, and Max Miller made the trip up the M1 to take part in the Minor (under 110 grade) section. It proved to be a very worthwhile journey as Max finished joint second and took home with him a share of the prize money, so many congratulations to Max on his impressive score of 5 out of 6. You can find out more about this tournament, and more about chess in Nottingham, by visiting their website here. Our second annual tournament of each season is the Christmas Cracker, which again this time took place at Ruskin Junior School in Wellingborough. There was another fine turn out for this competition, which also forms the second part of the NSCA Grand Prix. All the scores from the Chrsitmas Cracker can be found here, whilst the latest updated Grand Prix scores can be found here. The third part of the Grand Prix is the County Championships which take place on Saturday 7th February, and an entry form for that can be downloaded here. One of the major individual junior chess tournaments of the season took place during December, when the London Junior Chess Championships were held recently. Some sections are played before Christmas, with the other sections between Christmas and New Year. A number of Northants players made the trip down, and there were some good performances, including 3.5 out of 6 from Sam Herring in the Under 16 Championships. Amoung other Northants players taking part were Max Miller, Joseph Meisner, and Anirudh Kandikattu. All their scores, and those from all sections, can be found via the LJCC website here. Following on from Max Miller's great performance in Brazil, he has now appeared in the Northants Herald & Post, and you can read the article here. Junior Congress photos.......and scores too! 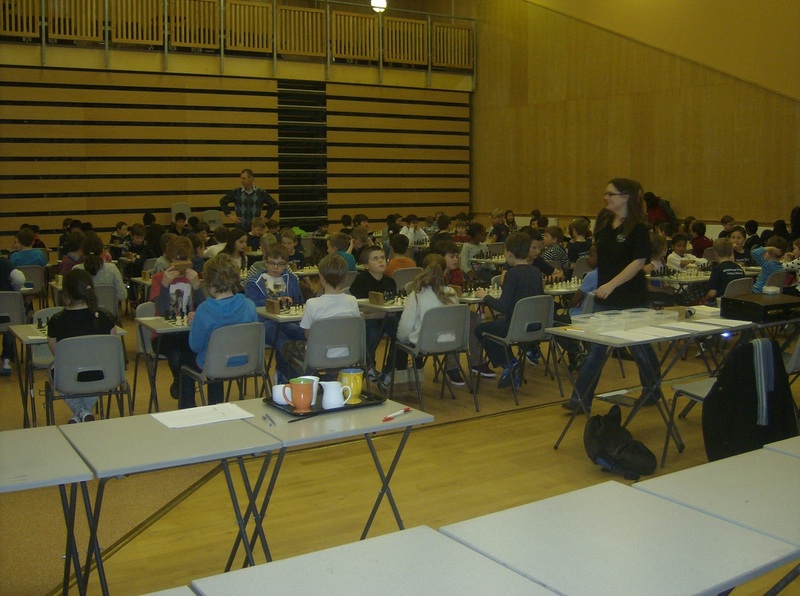 Photos from the 35th Northamptonshire Junior Chess Congress are finally now available to view, and for the first time we have also included the scores of every entrant. So, you can find the photos here, and all the scores here. A number of other county players have been in action too, but a little closer to home. However, they were some miles apart. It was the annual Quadrangular tournament in Liverpool, which comprises teams from Scotland, Wales, North of England, and the Midlands. From Northants Owen Robinson, Eva Ressell, Ryan Reed and David Collier were playing in the Midlands team, and details of the match can be found here. At the same time, Sam Herring was playing in the Super Rapidplay Open section of this years London Chess Classic - a competition that comprised of over 400 entrants! Full details of that can be found here. Northants player Max Miller made the very long journey to South America, to represent England as part of their team playing in the World Schools Chess Championships, which took place in Juiz De Fora in Brazil during the end of November and into December. He will soon be returning, having played in the under 11 boys section which comprised of around 70 players. In all Max had nine games to play, from which he scored a very impressive 5.5, resulting in him finishing well inside the top 20, and the NSCA would like to congratulate Max on this brilliant result. 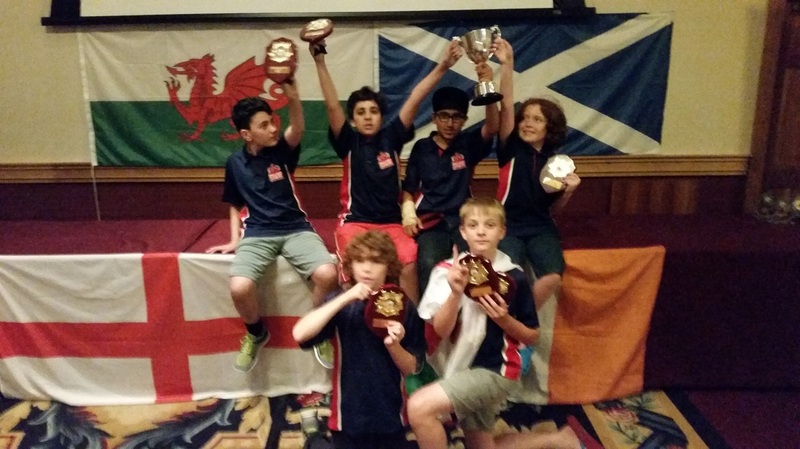 You can see all the results of Max and all of the England team by clicking the official World Schools Chess Championships website here, whilst you can also read more on the ECF website here. The England Team playing in Brazil, including Northampton's Max Miller. 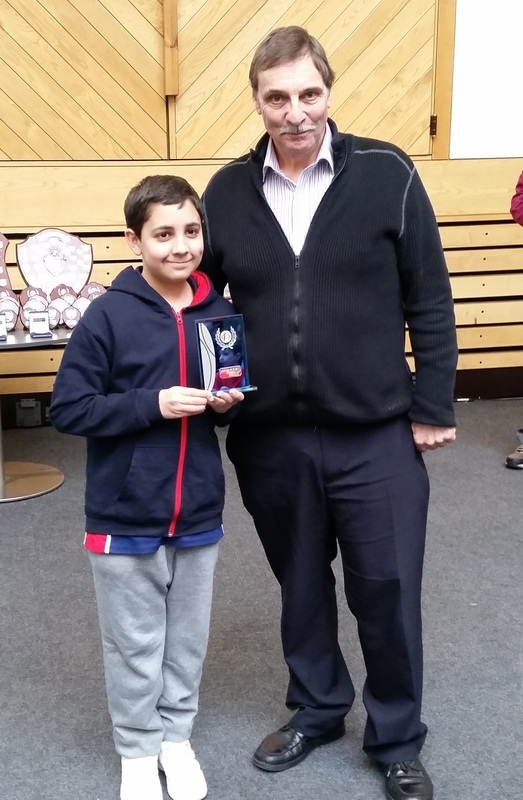 The HE Atkins memorial is annual Leicester Chess Congress, and in the major section Owen Robinson remained undefeated, drawing all of his games! Well done Owen on finishing joint 15th out of a strong field of 46 players. The results from all the sections can be found here. This year's Congress was a resounding success, with a record number of entries for the first tournament of our season which took place on November 22nd. Numbers were up in every section, with around 160 players in total taking part, and it was very pleasing to see so many players from out of the county. In particular a large number of players travelled up from Moorlands School in Bedfordshire. However, schools from within Northants were also extremely well represented, with a large contingent from Laxton Junior School in the north east of the county taking part, and indeed Laxton players performed extremely well to take home a good number of the trophies. Photographs of some of the winners will appear soon, along with the first update of all the sections in this season's Grand Prix. But it wasn't only trophies that were being played for in the congress, and in the next few weeks all those players performing to the required standard in the younger sections will soon be receiving invites to join either the under 9 or under 11 county squads for the coming season, so keep an eye out for emails perhaps coming your way very soon. In the meantime, congratulations and many thanks to every single player who took part, and who all contributed to the great success of the day. These championships took place in Leeds over the first weekend in November. There were a number of sections, and Northants player Max Miller took part in the Under 11 Trial section on the Saturday, and then also played in the Junior Under 12 section on the Sunday. On both days he scored an impressive 3 out of 5, resulting in him finishing joint 8th out of 36 in the trial, and 6th in the Under 12. His score in the trial results in him gaining half a norm towards qualification for playing in the England trial next April, so many congratulations to Max. All the scores from all the sections of the British Rapidplay Championships can be viewed here, whilst if you would like to know how YOU can go about trying to make the England trial all the details can be found here. Many congratulations to the team from Chesspoints Northanpton, who finished in an excellent second place in the opening weekend of this season's Junior 4NCL. There was a strong turnout of 28 teams, and Chesspoints came within a single point of the victors, thanks to their team of Owen Robinson, Ryan Reed, Max Miller, and David Collyer. You can find out more about the Junior 4NCL, and see all the scores and results, here. Max Miller meanwhile travelled south to take part in the Barnet Junior Autumn Tournament - a qualifier for the London Junior Chess Championships in December. He too had a great performance, and also scored 4 wins and 2 draws, to win the under 12 section there. This followed the wonderful news that Max has just been chosen to be part of the England team travelling to the World Schools Chess Championships taking place in Brazil at the end of November. The NSCA would like to congratulate Max on this achievement, and wish him all the best as he starts to travel the globe with his chess. Well done Max. Owen Robinson travelled up to Manchester to take his place in the UK Chess Academy Silver Plate North competition for this year, and came away as the under 17 Champion after scoring 4 wins and 2 draws! Many congratulations to Owen on this wonderful performance, and we will update you on all the scores and results once they become available. 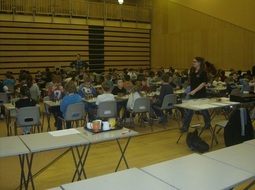 Last weekend saw the climax of this year's UK Chess Challenge, with the two day Terafinal taking place in Loughborough. Two Northants players, Eva Ressel and Thomas Caskey, took part in one of the challengers sections, with Eva performing superbly to finish joint 3rd and joint Top Girl. Many congratulations to Eva on this fantastic result. Next month sees the UK Chess Academy Silver Plate Competition, to which a number of other Northants players may be taking part in - we'll let you know how they do. In the meantime, you can view photos from the Terafinal here, and all the results here. This year's British Chess Championships came to a close at the weekend. Northants weren't quite so well represented as in recent years, although with the venue being Aberystwyth this time out perhaps people were saving themselves for next year when the venue is much closer to home, at the University of Warwick near Coventry! However, despite the lack of representation, two players did particularly well. Sam Herring was participating in the Major Open - an extremely strong competition, second only to the main event, for which Sam played well above his grading to finish in a very impressive joint 4th. Well done to Sam on this outstanding performance. Meanwhile, in the main championships, an ex NSCA Junior was also playing above his grade, with James Jackson being awarded most improved rating performance. Owen Robinson was also playing in the under 16 section, but unfortunately found the going a little tough there, whilst from just over the border from Leicestershire Shyam and Kishan Modi were playing in the under 11 section, with Shyam performing excellently to finish joint 4th. All the details and scores for all the sections at the British Championships can be found via their web site here. At our recent AGM, as expected, for a number of reasons a few of the NSCA officials relinquished some of their roles within the Association. As a result, we are extremely pleased to announce the appointment as new Chairman of the Association as Alan Bailey. 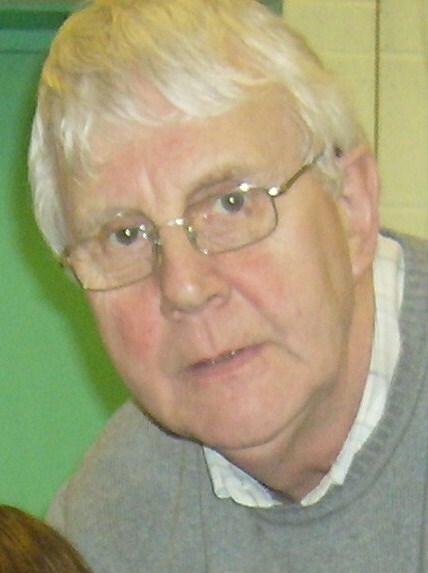 Many of you will know Alan already, as he is a very active supporter of junior chess within Northants, and has often been seen at our tournaments either helping with the organisation, or supporting some of the junior players that he is involved in coaching. Now he is officially part of the NSCA! We welcome Alan into the Association with open arms, and thank him for taking on the role of Chairman in what are changing times for the NSCA. We would however like to express our huge gratitude for the unceasing work that John Warren has undertaken during his many years as Chairman - without him the NSCA would not be in existence today. John will still continue to be involved with the NSCA, now in his new official role of Congress Coordinator. Many thanks also to Ian Rose, who has run the under 11 squad for the past few years, initially with the help of John Marray, and latterly with the support of many other members of the Association and a number of parents. Ian will however continue his role of Web manager. This all means that there is plenty of room within the NSCA for further volunteers, and we would welcome along anybody wishing to be involved, especially parents of junior chess players. If you would like to consider this, or to find out more, then please feel free to contact us. At least two junior Northants players are taking part in this year's British Chess Championships. The event this year takes place in Wales, at the University of Aberystwyth, and Owen Robinson is playing in the under 16 section, whilst Sam Herring is competing in the Major Open. There is still time to enter some of the sections so, if you fancy a trip to the beautiful West Wales coast, and you want to play a bit of chess at the same time, then what are you waiting for? For full details of all the Junior sections that will be taking place, visit the official British Chess Championships website here. As the events at this year's Championships unfold we will keep you up to date with how the Northants Junior players fair. There was a good turn out from Northants as 17 players made the trip up to Manchester for this year's Northern Gigafinal - this is the next step on the UK Chess Challenge ladder, after the Megafinals back in May, and for the top performing players it can mean qualification for the two day Terafinal in August, or alternatively the Plate competition. This year two players from Northants managed to qualifiy to play in the Challengers section of the Terafinal, with Thomas Caskey (Under 10 Boys) and Eva Ressel (Under 14 Girls) both finishing second in their sections. Many congratulations to both Thomas and Eva. Congratulations also to those players who have qualified for the Plate competition. They are: Joseph Meisner, Max Miller, William Holmes, Tom Calveley, Ben Barnes, Brandon Ingle, Ryan Reed, and Owen Robinson. And well done also to those players who made the long journey but just missed out: Thomas Jukes, William Caskey, Jush Gorania, Aashish Reddy, Michael Ward, Noah Bennett, and Sam Kennedy. From just outside the county, but still with Northants connections, Luke Tooth, Nicholas Lees and Peter Mottram-Epson qualified for the plate, whilst Kishan Modi has qualified for the Challengers section of the Terafinal, so well done to these, and other "out of county" friends that we know were also taking part. For all other details of the UK Chess Challenge, you can visit their websites here and here. Whilst details of the UK CHess Academy, who host the Plate competition, can be found here. We have one or two county players taking part in the Southern Gigafinal soon as well, and we will keep you up to date as to how they do. The 21st June saw the last NSCA tournament of the season, the annual SSAFA competition, which took place at Ruskin Junior School in Wellingborough. As usual this also formed the final part of the NSCA Grand Prix. Many positions changes took place right up until the end, and in particular the Under 9s Schools section was an extremely close fought affair. The SSAFA results can be found here, whilst the final Grand Prix results can be found here.